Frequently Asked Questions about Dumpster Rental, Demolition and Rubbish Removal. Renting a dumpster can be pretty intimidating. Let us help you make you life smoother. How far in advance should I book an appointment ? 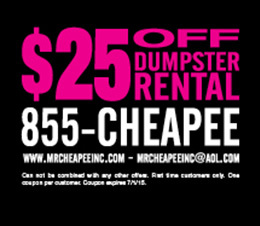 We often can deliver your dumpster or pick up your dumpster the same day you call. Please try to schedule the work in advance to make sure the work can be done in a timely fashion. The dumpster rental term is fourteen (14) days. You must call us on the 6th day by 11am to avoid extra day surcharge at the rate of $10 per day. What can't I put in my dumpsters? No toxic chemicals or hazardous wastesHazardous waste, dirt, industrial waste, chemical products, oil filters, herbicides & pesticides, radioactive material, solvents, paint (except completely dried latex paint cans, no liquids), other flammable liquids, aerosol cans, propane tanks, motor oil, transmission oil/lubricating/hydraulic oil/ oil filters, contaminated oils (mixed with solvents, gasoline, etc. ), antifreeze, appliances, petroleum contaminated soil/lead paint chips, tires, batteries, computers, monitors, televisions, microwaves, fluorescent tubes, railroad ties, medical waste, asbestos, animals, barrels. Material must be level at the top of the container; nothing can be sticking out of the top. Only solid waste items are permitted into containers. No free liquids of any kind are allowed in the container. Liability for appropriate waste remains with the customer as agreed to in the terms and conditions. How high can I load my dumpster? Please load only to the marked wall edge of your dumpster. If over-loading occurs, additional charges will be assessed. If unsafe, the container will have to be unloaded, by the customer, to a safe level before we will remove it. Each town, city and municipality has different regulations concerning dumpsters placed on their property. Please check with your local municipality. Can I put my dumpster on the street? Check with Proper Authorities if It’s Going on the Street Your local parking enforcement office or building permit office can give you information about permits needed if you’re putting the container on the street. This is a real concern, and you definitely need to clear this up. If you have room to place it on your own property, you won’t have these worries. If you live on a street with a neighborhood association, it is almost certain that the provisions of the homeowner’s association contract do not allow for a rolloff. Exemptions may be available by appearing before the association’s board. Yes, Mr. Cheapee’s is fully insured which includes general liability, and workers compensation for all demolition work. How do we dispose of the junk we haul away? We recycle!Most of the materials that we haul away goes to recycling centers and city transfer stations. Some materials are donated to charities and people in need. What we cannot donate goes straight to your local dumping facilities. Why do they use our service? What do they want us to remove? Is there anything we do not remove? No toxic chemicals or hazardous wastesYes, we do not remove toxic chemicals, hazardous materials/products, some paints solvents, asbestos, chemicals, oils, oil drums, and medical waste. We recycle!We recycle all recyclable items. This includes paper, wood, metal, plastic, or e-waste. Leftover waste is taken to the transfer station or landfill. First, make sure that your street or driveway is clear for where you want the container to go. Sitting it too far from your house can cause you to have to walk everything a long distance, which is not ideal. Second, you might have to park far away from your house if the Dumpster is taking up your parking space. Lastly, these containers can be pretty tall. If you are not very tall or will have trouble heaving the rubbish up into the container, you might need to create or buy some steps or solid boxes to make this process easier on your body.